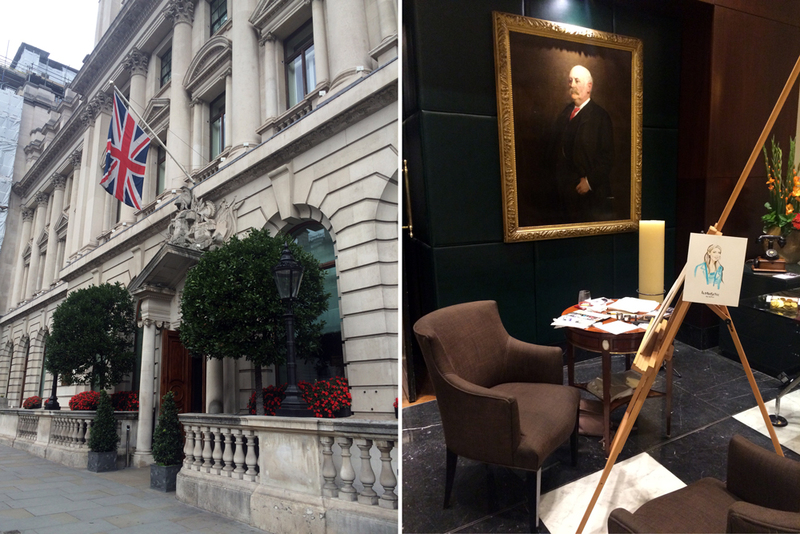 If you follow me on instagram, you'll see I've been busy working on an exciting project with Sofitel London. Over the last three months, I've been creating a series of illustrations which will help to promote the launch of their new exhibition, La Parisienne. The "La Parisienne" is a fashion photography exhibition which launched during Paris Fashion Week and celebrates sophisticated French style. To stay within the fashion theme, they asked me to help them create a lookbook for guests, to help them create that French look. The style guide was written by style blogger, Ella Catliff, and so the two of us worked together to get the illustrations just right. And, if that wasn't already a great job, I was invited to be "illustrator in residence" during the launch week of the exhibition. During my week-long residency, I attended the VIP launch event do draw quick portraits of guests. The rest of the week, I was set up with an easel in the lobby of the hotel, where guests and visitors would sit for me for more leisurely fashion portraits. It was a wonderful experience, and I painted so many lovely people. You can see more pictures of my live drawing on lil collective's website. My residency is over now, but the exhibition is on until the end of November, and so the style guides are still available in the hotel. If you like vintage fashion photography, it's well worth dropping into the hotel to see. And even better if you have time to have a cocktail in the bar. La Parisienne runs until 17 November 2016 at Sofitel London St James.